Retrofit opportunities were pursued at each audited school and a total of four retrofit projects were completed. Since the funding offered through this project would have only covered a small percentage of the work recommended, none of the schools opted for any large scale retrofits. However, two of the audited schools that were willing to carry out more modest projects were also willing to provide additional funds to accomplish them. operating the A/C systems in the fan “auto” mode during hot and humid periods. After discussions with school personnel, it was decided to begin retrofit work by sealing soffit vents around the perimeter of the building. 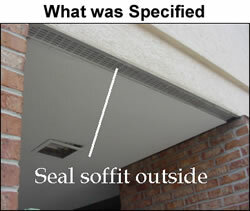 Although outside soffit sealing was specified, the contractor was planning on attempting to seal off an opening inside the space above the eave. This plan still would have left significant areas unsealed at a cost of approximately $3,000 more than what was specified finally costed. The figure below shows the differences in the specified and planned sealing solutions. After school personnel reported that the soffit sealing was completed, FSEC staff returned to the school to retest building airtightness. At that time however, it was noted that about 25% of the building perimeter soffit had not been sealed. The building airtightness test was still completed, and results adjusted to account for the missing length of soffit sealing. After the soffit sealing was fully completed, additional CO 2 and RH monitoring was conducted. The building is now significantly tighter, but monitored post retrofit CO2 and RH levels indicated that followup on other previously agreed to recommendations was still needed to improve the conditions in the building. However, after this initial retrofit phase, repeated phone calls and emails recommending further retrofit work went without response. As a result of the general lack of participation, it was not possible to realize the potential benefits that the retrofits might have provided. tightening building envelope/evaluate fan coil leak openings. Primarily due to the scope and cost of the recommended retrofits, school personnel in this case were not willing to undertake the project. However, one of the most pressing issues at this school was the apparent occurrence of mold in two classrooms. 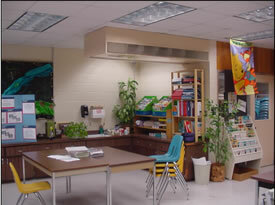 In order to resolve this situation, school personnel installed a ceiling mounted dehumidifier for the two classrooms. Pre and post dehumidifier installation conditions were monitored in the classrooms. Post retrofit relative humidity levels were found to be running between 40% and 50% most hours in these two classrooms, which is a significant drop from before the installation. While this retrofit strategy did not provide the school-wide conditions and energy benefits that the more comprehensive retrofit recommendations were designed to provide, the results do indicate that the dehumidifier is effectively controlling humidity in this area of the school. A school board engineer also later reported back that the dehumidifier was working well and the previous mold problems in these classrooms have not continued post retrofit. .
During the conditions audit at the Washington State Elementary School three concerns were identified as targets for possible retrofit work. The ventilation for both the gym and large multipurpose community room was controlled by timers set for periods of occupancy. The occupancy of these areas vary greatly even during normal schools hours. Controlling ventilation based on occupancy as indicated using CO 2 sensors was proposed as a way to maintain recommended ventilation and potentially save on heating cost by reducing periods of over ventilation. The audit also identified a mixing problem in the gym. Ventilation air was short circuiting from the supply to the return without mixing into the occupied zone. The retrofit proposal included modifying and redirecting the supply diffusers to better ventilate the occupied area in the zone. Actual retrofit work at the school included adding CO 2 sensors to the control circuits for the gym and multipurpose room and altering the supply diffusers in the gym to provide more mixing and minimize short circuiting to the returns. Temperature, relative humidity and CO 2 levels in the gym and multipurpose room were monitored for over 3 weeks both pre and post retrofit. Data on natural gas consumption for the monitoring period was collected and ambient weather conditions recorded. Outside air damper positions for the gym and multipurpose room were also recorded for the pre and post monitoring periods. While initial analysis of the collected data indicated lower energy use in the building post retrofit with normalized weather, a review of recorded damper positions suggested that the control settings may not have been properly set for implementation of the desired control strategy. The control program was reset, and school district personnel confirmed that the changes made have in fact improved the existing air mixing problem, and complaints about odors from off gassing of the floor finish have ended. Also, no problems were reported from going to CO 2 based ventilation control for the multipurpose room and gymnasium. adding mechanical ventilation for a six classroom portable with restrooms that are presently without any mechanical ventilation. It was anticipated that the energy savings from more efficient operation of the ventilation provided to the common core of the building (gym, cafeteria, and auditorium) would offset the added cost of providing proper ventilation to the classroom areas. Based on available funding, it was decided to address the first two items. Maintenance performed by the district to address the unit ventilator recommendation was completed during the summer of 2003. Unit ventilators were cleaned including outside air intakes and calibrated. Dampers, controls and valves were checked, adjusted, and replaced as needed. Ventilation of the gym, cafeteria, and large auditorium was also improved. The multizone fan system was reconfigured so that these areas could be operated as isolated zones by the operation of dampers controlled by CO 2 sensors for the cafeteria and auditorium and an occupancy sensor for the gym. Installation of ventilation controls by an outside contractor proved to be problematic though as a review of the installation identified incomplete work and non-functioning parts. These problems delayed the completion of the project and its review for a number of months. Temperature, relative humidity and CO 2 levels in the cafeteria and auditorium and selected classrooms were monitored pre and post retrofit. Maintenance on the unit ventilators in the classrooms produced a significant improvement in measured flows of outside air provided to each room with average outside air flows going from 149 cfm pre-retrofit to 356 cfm post-retrofit with 16 out of 20 rooms appearing to be adequately ventilated post retrofit versus only 2 of 20 pre retrofit. CO 2 monitoring also confirmed improved ventilation rates. Much of the data collected post retrofit on CO 2 levels in the cafeteria and auditorium appears corrupted making it difficult to confirm post retrofit system operation. Based on an energy audit performed by a private company as part of the state of Oregon’s SB 1149 program however, energy savings from the multizone fan system retrofit are estimated at 308 MMBtu/year with a dollar savings of $1,997/year. This yields a simple pay back of 4.5 years for a $9,000 investment.